Deepen your sense of the past at sights like Westminster Abbey and Buckingham Palace. Your cultural itinerary includes sights like National Gallery and Victoria and Albert Museum. Explore London's surroundings by going to Brighton (North Laine & Gustamps). And it doesn't end there: take an in-depth tour of Natural History Museum, learn about all things military at Churchill War Rooms, pause for some serene contemplation at St. Paul's Cathedral, and steep yourself in history at Houses of Parliament. To see more things to do, where to stay, and other tourist information, read London itinerary builder site . If you are flying in from United States, the closest major airports are London Heathrow Airport, London Gatwick Airport, London Stansted Airport, London City Airport, London Luton Airport and Southend Airport. In September in London, expect temperatures between 67°F during the day and 51°F at night. Wrap up your sightseeing on the 18th (Wed) early enough to take a train to Paris. Let the collections at Musee d'Orsay and Chateau de Fontainebleau capture your imagination. Champs-Elysees and Arc de Triomphe will appeal to history buffs. Change things up with a short trip to Palace of Versailles in Versailles (about 48 minutes away). 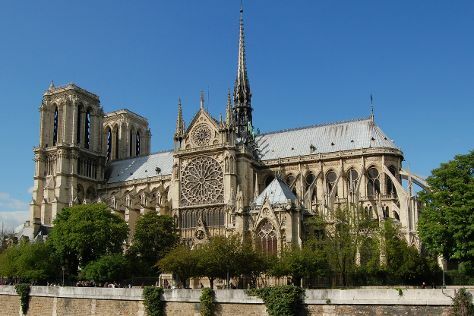 The adventure continues: admire the striking features of Cathédrale Notre-Dame de Paris, take in the architecture and atmosphere at Basilique du Sacre-Coeur de Montmartre, head off the coast to Île de la Cité, and admire the masterpieces at Louvre Museum. To see ratings, traveler tips, other places to visit, and other tourist information, read our Paris tour app . Traveling by train from London to Paris takes 2.5 hours. Alternatively, you can fly; or drive. The time zone difference when traveling from London to Paris is 1 hour. In September, daytime highs in Paris are 70°F, while nighttime lows are 53°F. Finish your sightseeing early on the 22nd (Sun) so you can travel to Edinburgh. Popular historic sites such as Bamburgh Castle and Edinburgh Castle are in your itinerary. Your cultural itinerary includes sights like Royal Botanic Garden Edinburgh and Royal Yacht Britannia. Get out of town with these interesting Edinburgh side-trips: Grace Darling Museum (in Bamburgh), Royal Border Bridge (in Berwick upon Tweed) and Rosslyn Chapel (in Roslin). There's lots more to do: enjoy the sea views from Calton Hill, admire the striking features of Melrose Abbey, wander the streets of Edinburgh Old Town, and sample the fine beverages at The Scotch Whisky Experience. For maps, reviews, traveler tips, and tourist information, you can read our Edinburgh trip itinerary planner . Getting from Paris to Edinburgh by flight takes about 5.5 hours. Other options: do a combination of flight and train; or take a train. Due to the time zone difference, you'll gain 1 hour traveling from Paris to Edinburgh. Plan for little chillier temperatures traveling from Paris in September, with highs in Edinburgh at 62°F and lows at 47°F. Finish up your sightseeing early on the 28th (Sat) so you can travel back home.